The total solar eclipse of Aug. 21, 2017, as seen over Madras, Oregon. On April 8, 2024, plants, animals and humans across North America will encounter a celestial experience like no other: a total solar eclipse. Earth will experience several total solar eclipses from 2019 to 2021, but the April 2024 event will be the first to pass through the United States since the 2017 Great American Solar Eclipse. The 2024 total solar eclipse will take a grand journey across North America, beginning on the Pacific Coast of Mexico, traveling up through the U.S. from Texas to Maine, and ultimately reaching the Atlantic Coast of Canada. 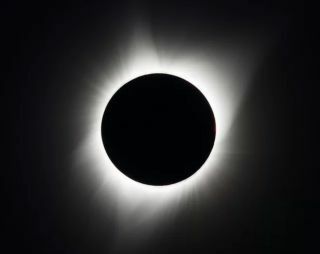 The sight of the ethereal solar corona, the 360-degree sunset and the collective awe expected across the continent are just some of the reasons scientists and skywatchers are looking forward to the 2024 total solar eclipse. Here is Space.com's complete guide to the epic event. A view of the Aug. 21, 2017, total solar eclipse over Ross Lake in Washington's North Cascades National Park. REMEMBER: It is safe to view the eclipse with the naked eye only during totality, when the sun's disk is completely covered by the moon. Otherwise, skywatchers should NEVERlook at a partial solar eclipse without proper eye protection. Serious eye damage — like an eclipse imprint burning into the retina— and blindness can occur as a result of looking directly at the sun, even when it is partially covered by the moon. See our complete guide from 2017 to find out how to view the eclipse safely. Total solar eclipses are amazing, especially considering how peculiar they are. They're quite a chance occurrence in cosmic geometry: The moon orbits about 239,000 miles (385,000 kilometers) from Earth, and that's just the right distance to appear the same size in the sky as the sun, which is significantly larger and much farther away. The moon and the sun line up and create total solar eclipses only about once every 18 months. On average, two to five solar eclipses occur each year, but these don't always result in total eclipses. The solar eclipse that will cross the continental U.S. on Oct. 14, 2023, for instance, will be annular, meaning the moon will block only the center of the sun, leaving an outer ring of the solar disk visible. That will happen because the moon will be at a point in its orbit that is too far from Earth to completely block out the sun from our perspective here on Earth. While it will still be a fantastic celestial event, the annular eclipse won't darken the skies the way a total solar eclipse will. What will I see during the total solar eclipse? Within the eclipse's path of totality, spectators can expect their senses to come alive. As the total solar eclipse approaches, there will be a gradual dimming of the sky. Viewers will notice a more obvious change if they're wearing protective eyewear: They'll see the moon's round outline slowly block more and more of the sun, at first making it look like a fat banana, and later, more like a ring. As the moon continues to move across the face of the sun's disk, it will get cooler all around. Plants and animals will start to react, and the sounds of nocturnal creatures might start up. During the few minutes of totality — and only then — spectators can remove their protective eyewear and stare at the ethereal halo of the sun's corona. Make sure to take a moment to look for stars or planets shining in the dim sky, and enjoy the 360-degree sunset that the total eclipse produces. Keep an eye out for lunar mountains and solar flares, too, which may be visible at the moon's edges. A total solar eclipse will be visible on April 8, 2024, over Mexico, the United States and Canada. Where will the total solar eclipse be visible? The solar eclipse first makes landfall in the Mexican state of Sinaloa, then travels from Texas to Maine in the U.S., clipping parts of continental Canada along the way. The eclipse finishes its North American journey over Newfoundland in Canada. Skygazers will have a plethora of options to choose from when selecting where to view totality. According to an interactive Google map developed by Fred Espenak, a researcher at NASA's Goddard Space Flight Center and an eclipse modeler, and astrophotographer Xavier Jubier, an astrophotographer, the 2024 total solar eclipse will first touch North America off Mexico's Pacific Coast, and the lunar shadow will progress in a northeast direction. Outside the path of totality, skywatchers in Mexico, the U.S., Canada, Central America and the Caribbean will see a partial solar eclipse. Here, the moon will appear to take a smooth bite out of the sun's disk. During a partial eclipse, it is never safe to view the sun with the naked eye. When will the total solar eclipse occur, and how long will it last? The total solar eclipse duration depends on the viewer's latitude, longitude and proximity to the center of the totality path. The greatest duration will be 4 minutes and 28 seconds, and will occur within the Mexican state of Durango, according to predictions by Espenak. The chart below lists the moment when the eclipse and totality begin and end for a handful of locations that lie within the totality path, according to data from NASA and Espenak. For information on other cities and towns, zoom in on the Google Eclipse Map, and drag a marker to the desired spot. Do I need any equipment to view the 2024 eclipse? Anyone planning to view the total solar eclipse of 2024 should get a pair of solar viewing glasses. By using these extra-protective shades, observers can look directly at the sun before and after totality. The following four companies sell eclipse glasses that meet the international standard (ISO 12312-2) recommended by NASA, the American Astronomical Society and other scientific organizations: Rainbow Symphony, American Paper Optics, Thousand Oaks Optical, Lunt Solar Systems and TSE 17. It's important to note that regular sunglasses cannot be used in place of solar viewing glasses. See our complete guide to find out how to view the eclipse safely. The moon is seen passing in front of the sun during a solar eclipse on Aug. 21, 2017, from Ross Lake in Washington's Northern Cascades National Park. What else should I know before viewing the eclipse? The U.S. Department of Transportation issued warnings and guidelines in anticipation of the 2017 total solar eclipse, and the department will likely make traffic predictions for the 2024 total eclipse closer to the date. Vehicle volume varied in 2017. Traffic on I-40 was not any worse than usual, according to Space.com reporter Hanneke Weitering, who traveled from New York City to Nashville, Tennessee, to view the 2017 total solar eclipse. But Wyoming fared worse; the state experienced a record-breaking traffic jam, with more than half a million cars on the road, according to The Denver Post. If you need to arrange a hotel, do so as early as possible. And if camping is a possibility, add some wilderness grandeur to your eclipse experience by checking out any of the national parks along the path of totality, many of which may plan events for the special day. You can also enjoy the eclipse outside the path of totality if travelling isn't an option. For those who chose not to travel into the path of totality in 2017, many local events at museums and other institutions offered a fun way to view the partial solar eclipse. While the weather is still uncertain, astronomer Jay Pasachoff told Space.com in an email that Mexico and Texas will probably offer the best viewing spots for the 2024 total eclipse. This map shows annular and total solar eclipses that will occur between 2041 and 2060. When is the next time a total solar eclipse will be visible from the U.S.? The next total solar eclipse visible from the U.S. after the 2024 eclipse will occur in 2044. This eclipse will be visible in Montana, the Prairie Provinces of Canada and the Arctic. The next cross-continental total eclipse will happen the following year, in 2045, when the moon's shadow will sweep across the U.S. from northern California down to Florida.